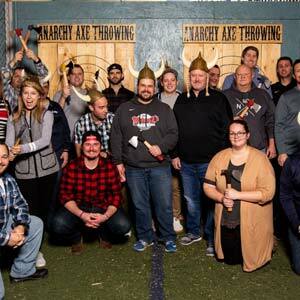 ANARCHY AXE THROWING IS CENTRALLY LOCATED ON INDY’S NORTHEAST SIDE AT 96TH AND ALLISONVILLE ROAD. 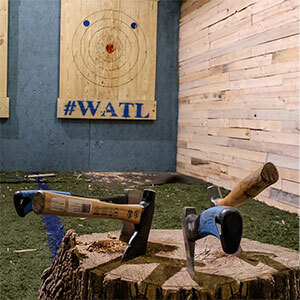 AXE THROWING IS A GREAT WAY TO LET OFF STEAM; WE OFFER TEAM BUILDING, BIRTHDAYS, BACHELOR/ETTE PARTIES, CORPORATE EVENTS, LEAGUES, DATE NIGHTS AND CHARITY EVENTS. AXE THROWING IS FOR EVERYONE NO MATTER YOUR SKILL. OUR AXE-PERTS WILL HAVE YOU THROWING WITH CONFIDENCE IN NO TIME AT ALL. CLICK HERE TO FIND OUT MORE ABOUT LEAGUES.